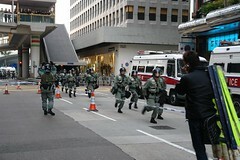 What started out as a peaceful demonstration down Lockhart Road in Wan Chai. Then all of a sudden at around 18:00 the protesters rushed the police line trying to push towards the Hong Kong Convention & Exhibition Center, where the Sixth WTO Ministerial Conference is being held. 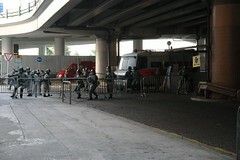 The Hong Kong Police was well prepared during the peaceful march. Although, they were not visible, there was hundreds of police in riot gear all prepared, just two streets over on Gloucester Road. 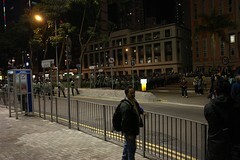 There were also about a hundred police vehicles parked on Jaffe Road parallel to the demonstration march. When the protesters rushed the police line on Lockhart Road, the regular police and the police in riot gear began closing off all roads leading to Lockhart Road from Gloucester Road and Jaffe Road. They were telling all stores and buildings to close down and draw their respective metal gates. The protesters try to rush the police at Marsh Road, the police blocked them with police vehicles and policemen in riot gear. At one point the police created a double wall of officers behind the two police vehicles blocking Lockhart Road, while trapping about 10 police officers on the other side with no riot gear. After about 15 minutes the protesters quieted down and the 10 police officers were allow out from the other side. Every few minutes the police would relief their line of officers with reinforcements and the ones that were on would regroup, check for injuries and ensure all equipment are still with them. 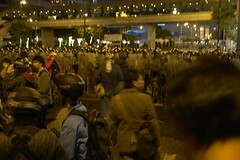 While more reinforcements are prepared along Hennessy Road and Marsh Road. 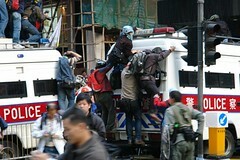 The press was dangerously utilizing the police vehicle as high ground for taking photos of the protesters' clash with the police, as the protesters were trying to rock the police vehicle over on its side. The Police also created another police line across Marsh Road just South of Lockhart Road, because there was protesters trying to rush in from Hennessy Road into Marsh Road. The police created a stand off and strong hold at the intersection of Lockhart Road and Marsh Road. After about an hour the stand off at the intersection of Lockhart Road and Marsh Road seem to have died off. 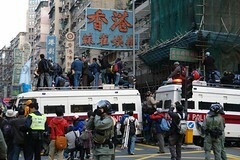 The police then realize that the protesters had quietly moved along Hennessy Road, three blocks down towards Fleming Road, which is the main artery into the restricted area around the convention center. What seems all of a sudden, the police in riot gear at Lockhart and Marsh got onto police vehicles parked along Jaffe Road and left. At this time the protesters had already broken another police line and crossed over the Fleming Road bridge towards the convention center. The police created a wall of officers in riot gear three layers deep along Harbour Road blocking the protesters' advances from Fleming Road. Although most of the time the protesters were peacefully chanting anti WTO slogan and message against the United States. A woman was speaking to the police through a PA, telling the Hong Kong Police that they are good and to let the protesters pass. This lady also lead the crowd in chanting "We love Hong Kong" in a similar melody as the Hong Kong Tourist Board's TV advertisement. The resourceful Korean farmers took apart the metal fences that lined the road and began building a metal rampage to drive into the police line, which the police reacted by firing their Pepper Spray at the crowd, causing many to be incapacitated. 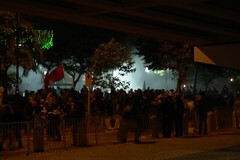 After a few more hours the police released tear gas and pepper powder bombs into the protesters. Causing all the protesters, by-standers and reporters to scramble to regain their composure. Fortunately, during my training as Auxiliary Police in Canada, I had been spray with Pepper Spray many times to be aware of the effects, so I was familiar with the stages of the affect of the pepper spray and how to handle it. But the wind was blowing in from Victoria Harbour, which means the cloud of pepper powder were following the retreating crowd towards Hennessy Road where a wall of police were waiting. All this time hundreds and hundreds of police officers in riot gear were lined up 4 - 5 layers deep along the East bound lanes of Gloucester Road. I had never in my life seen such a show of force by police, at least not live in person. When majority of the protesters retreated the police trapped about 900 of them on Gloucester Road surrounding them with layers of police officers in riot gear. This stand off lasted until 03:45 on Sunday morning, when the police began clearing the detainees one at a time and transporting them away in large Correction Department armored buses. 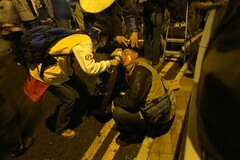 I must give compliments to the Hong Kong Police, most of them had a lot of self restraint. Particularly the regular forces. 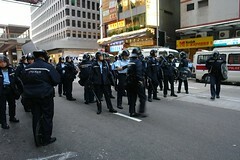 Although the auxiliary police were not too professional, many of them were shouting and mouthing off at the by-standers. The only other time I seen more self restraint were from the Canadian army during the Indian stand-off in Quebec. I saw injuries through out the night, both from protesters and police officers, but I made a point not to show any of their faces or their injuries in my photo documentary of the night's event.